Have you ever wondered what makes those chirping noises in your backyard? Those sounds are actually some insects’ means of communication. Among the insects that stridulate (sing or chirp) are crickets and the grasshoppers. These insects belong to the same order, Orthoptera. Some people might think that crickets and grasshoppers are alike but they are actually very different from each other. This article will describe each insect and lay down their specific differences. Crickets belong to the suborder Ensifera. They are nocturnal insects and you’ll see or usually hear them at night. Most crickets are pale green or brown so they can hide well in the shadows at night. Some crickets, though, come in bright colors. A characteristic of crickets is having long antennas. They make their chirping sound by rubbing their wings together. This is done to communicate or mate with their kind. Crickets have little “ears” on their front legs to detect the sound. Most crickets can jump but not necessarily fly. These insects are predatory and omnivorous. They eat grass as well as animal matter. Grasshoppers belong to the suborder Caeliferan. They are diurnal insects and usually come out in the day. Most grasshoppers are green so they can blend well with leaves and their grass habitat. Other grasshoppers come in neutral, gray, or light brown colors. Grasshoppers are bigger than their other insect relatives. One feature of grasshoppers is their short antennas. These insects sing or make their sounds by rubbing their hind legs with their wings. This particular type of call or means of communication is done when there is daylight. Grasshoppers can detect sound by their little “ears” located at the base of their abdomen. These insects can not only jump, but they fly as well. They are herbivorous and feed mostly on grass. 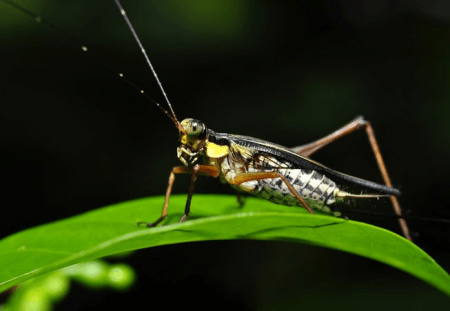 What is the difference between crickets and grasshoppers? 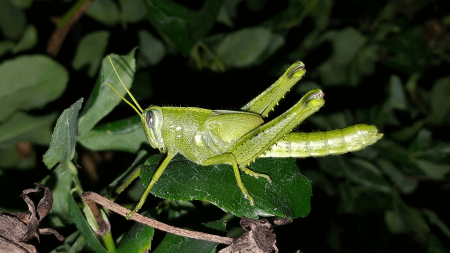 Crickets belong to the suborder Ensifera while grasshoppers belong to the suborder Caeliferan. Crickets are nocturnal insects whereas grasshoppers are diurnal. The usual colors of crickets are pale green and brown so they can blend well to their nighttime surroundings. Grasshoppers, on the other hand, mostly come in green so they can adapt to their grass habitat. Crickets have long antennas compared to the short antennas of grasshoppers. The means by which crickets stridulate is by rubbing their wings together. Grasshoppers stridulate by rubbing their hind legs against their wings. Both insects have little “ears” but they are located in different parts. For crickets, their “ears” are located on the front legs as opposed to grasshopper “ears” which are at the base of their abdomen. Crickets can jump but can’t fly and they are omnivores. Conversely, grasshoppers can jump and also fly and are herbivores.